What is the course all about? KnowledgeHut is offering certified scrum developer training in Noida to expand your career opportunities by staying relevant and marketable across all industry sectors, through the incorporation of agile methodologies. Aspirants will be at the receiving end of invaluable information coming from experienced Scrum experts, thereby honing the agile engineering skills to build software applications in a Scrum driven environment. 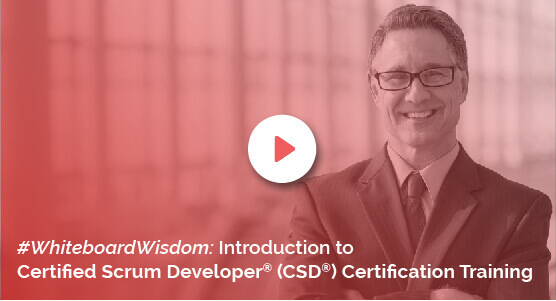 Benefits of the course The CSD course in Noida is focused on providing knowledge in Scrum framework, principles, roles and ceremonies and how to work in the Scrum environment. By taking a CSD course in Noida, you get an opportunity to associate yourself with a community of renowned Scrum experts who are have their eyes fixed on continuous improvement in the software development space. CSD training in Noida will help you develop quality code that adapts to changing requirements. The theory sessions offer actual design and code samples; while the hand-on sessions and exercises will help you grasp the knowledge in a clear and practical way. The KnowledgeHut Way KnowledgeHut training sessions are handled by highly qualified trainers who are adept at conducting workshops, practical sessions, and delivering lectures on the basics of agile management. Online course materials come in as ready reference for aspirants. The cost of the certified scrum developer certification in Noida will always be an investment that will help you build up a good career in this competitive environment.